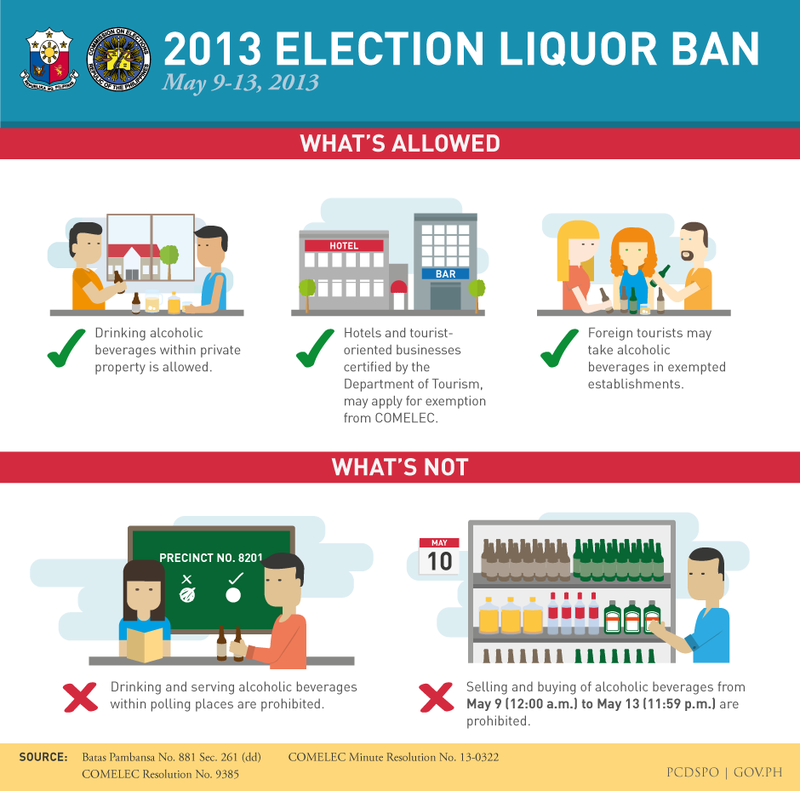 As part of the preparations for the coming midterm polls next week, the Commission on Elections (COMELEC) will begin implementing a five-day liquor ban beginning this May 9, Thursday. The poll body last February decided to extend the liquor ban from two to five days upon the suggestion of Francis Tolentino, chair of the Metro Manila Development Authority. In its Minute Resolution 13-0322, the commission noted that Tolentino originally wanted the liquor ban to be in effect for a longer period of time, possibly as long as the gun ban which lasts throughout the campaign period. Prior to Tolentino’s proposal, the COMELEC announced that it is sticking to the two-day liquor ban as prescribed in the Omnibus Election Code for the 2013 elections. Members of the Philippine National Police (PNP), National Bureau of Investigation (NBI) operatives, Regional Election Directors, Provincial Election Supervisors, Election Officers, and the COMELEC Election Laws Enforcement Team are all designated to enforce the liquor ban. Convicted offenders can be imprisoned from one to six years. They may also lose their right to vote and get elected. City Election Officers with respect to those located within their respective cities/districts. habitually in the business of catering to foreign tourist. Has paid the required taxes and/or fees imposed by the government or any of its agencies or instrumentalities.